Thirthahalli is a taluk head quarters, amidst dense forest and is about 65 Kms from Shimoga. Thirthahalli taluk is located in Shimoga district of Karnataka on the banks of river Tunga. It was called 'snow less Kashmir' in the olden days by travelers and visitors. Tirthahalli is one of the various holy sites in India. Its name is derived from the numerous theerthas (holy water) of Tunga river. Rameshwara Temple is located on the bank of river Tunga and attracts tourist and pilgrims for holy bath during the January. According to a Hindu legend, the sage Parashurama using an axe, chopped off his mother Renuka's head on the orders of his father, the great sage Jamadagni. Later, Parashurama tried to wash the blood stains off the axe by dipping it in various rivers. Despite his best efforts, a sesame-sized blood stain remained on his axe. It was washed away only when he dipped his axe in the Tunga river near Thirthahalli. This place is now called as Parashurama Thirtha (or RamaThirtha) and is the origin of the name Thirthahalli (halli means village in the native Kannada language). Near RamaThirtha, there is a stone mantapa called Rama Mantapa. This legend has made Thirthahalli a holy place for Hindus with a belief that a dip in the river Tunga here will cure one of all sins. Thirthahalli has a rich archaelogical history with Neolithic sites uncovered in Kunda Hill near Agumbe and portholed burial chambers found at Arehalli near Thirthahalli. A small fort was constructed at Kavaledurga, near Thirthahalli at around 9th century AD. The king of Belagutti, Cheluvarangappa strengthened this fort in the 14th century. Venkatappa Nayaka, a Keladi king, acquired this fort and constructed seven battlements to protect this fort in the 16th century. Hyder Ali conquered this fort in the 18th century and later the fort came under the rule of Tipu Sultan. Agumbe, Araga, Aralasurali, Arehalli, Basavani, Bejjavalli, Bhandya-kukke, Bidaragodu, Demlapura, Devangi, Guddekoppa, Hadigallu, Hanagere, Harogulige, Hedduru, Heggodu, Hodala-aralapura, Honnetalu, Hosahalli, Hunchadakatte, Kannangi, Konanduru, Kudumallige, Mandagadde, Megaravalli, Melige, Melinakuruvalli,	Mulubagilu, Naalur, Kolige, Neraturu, Nonaburu, Salgadi, Saluru, Sankadahole, Shedgaru, Singinabidre, Thirthamatturu, Tirthahalli, Triambakapura	& Tudur are villages in Tirthahalli. 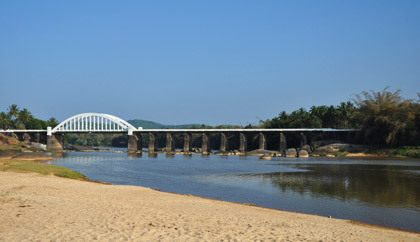 Thirthahalli has a unique bridge built by Sir. M.Visvesvaraya across the Tunga River which connects Thirthahalli on one side to a place called Kuruvalli on the other side. Now, Kuruvalli has become an extension of Thirthahalli. Sri Rameshwara Temple is the main Hindu temple of Thirthahalli. This temple is made of stone and is on the banks of the river Tunga. It is near the place Parashurama Thirtha which is discussed in the above section. The sanctum sanctorum of the temple has a Lingam which is said to have been installed by Sage Parashurama himself. The day when Parashurama cleansed his axe to remove the sesame-sized blood stain; is supposed to be the New Moon Day of Margashira month in the Hindu calendar. That particular day is termed as Yellu Amavasya day (Yellu meaning sesame and Amavasya meaning New Moon day) and every year on this day a festival termed as Yellu Amavasya Jatre is held in Thirthahalli. Even though the festivities last for more than five days, three days are very important for the common public. On the day of Yellu Amavasya, the Utsava Moorthi (main idol) of Lord Sri Rameshwara is taken to the river and holy Abhishekam (consecration) is carried out on the idol in the Parashurama Thirtha. After this, the devotees take a holy dip at this place. On the second day, the decorated temple chariot is pulled along the main street of Thirthahalli. This street; called as Car Street is a narrow street having a width of approximately 30 feet. The big chariot of the temple which occupies almost the whole width of the street, is pulled by devotees and the chariot even climbs a steep gradient on this road. On the third day, the Utsava Moorthi is taken on a Teppa(raft) on river Tunga to the river bank at Kuruvalli and brought back. This celeberation is called Teppotsava (raft-festival). On this day, a lot of colourful crackers are lit and also the river banks, Tunga Bridge and Rama Mantap are decorated with lights. This festival normally falls on last half of December or the first half of January. This festival attracts thousands of people from other cities. Two hills adorn Thirthahalli town. First one is Anandagiri Gudda and the second one is Siddeshwara Gudda. Anandagiri Gudda is located on Shimoga Road and Siddeshwara Gudda is located on Agumbe Road. Both are reachable by walk from the town. One can climb Anandagiri Gudda during any time of the year. Its height may be around 200 to 300 feet (60 to 90 m). There is large mantapa with a big doom on this hill. One can relax on this mantapa and can enjoy scenic beauty. Tunga College is on the base of this hill. For climbing Siddeshwara Hill, the preferred months are October and November. This hill is also about 200 feet in height. From the top of this hill, one will be able to see the other big hills of Shimoga District such as Kodachadri and Kundadri. Kuppahalli situated at a distance of about 16 Kms. east of Thirthahalli and 81 Kms. from Shimoga. This is fascinating locality which is the birth place of the great poet 'KUVEMPU'. There is the famous spot here know as Kavishilla where where the poet in his young days used it sit and contemplate. Agumbe is at a distance of about 80Kms from Shimoga via Thirthahalli. This is a famous place for viewing sunset. Abbey falls is Nearby Agumbe. Agumbe is one of the most scenic places on the Western Ghats of the Southern India. Added to the lush green view all around, the attractions for the visitors is the spectacular sunset and vast opportunities it offers to the trekkers.Agumbe is among the places that receive high rainfall and is rightly called the Cherrapunji of South India. Agumbe also served the screening of most of the episodes of one of the most popular television serial Malgudi Days based on R.K Narayan's novel. Ambuteertha is 10 Kms from Thirthahalli on Hosanagara road, this is the birth place of the river Sharavathi. Ambutheertha lies 16 Km to the North of Thirthahalli and is the birth-place of river Sharavati. The river flows towards North-west and plunges into the world famous 'Jog falls', (900 ft) before joining the Arabian Sea .2 Km from Ambutheerha, one can find the Accha kanya falls, where Sharavathi falls 6.1 meters in preparation before Jog falls. Famous temple of Sri Siddi Vinayaka (Ganesha Temple) and Matsyadhama which has lot of fishes at Tunga River are here. Chibbalagudde, is 10 Km apart from Thirthahalli, and is also near to Kuppalli. Matka is a beautiful place which is situated near thirthahalli a 15km distance from the town, where you can find the backwater and a submerged remains of the temple, and also it has a beautiful view of the backwater. Kundari is great place for trekking. Is on the way from Theerthalli to Masthikatte at a distance of about 12 km from Theerthalli. A Jain temple is perched on top of the hill. The view from the top the hill is really spellbinding. Kundadri hill is in fact a single gigantic monolithic rock formation with various outgrowths. A rough stone paved path leads one to the top of the hill. Packing some light refreshments and moving on to ascend the hill would be really a great idea. Season: Round the year except monsoon. Araga lies 9 KM north of Thirthahalli. In 14th century, Araga was the capital of a province of Vijayanagar empire, after Hoysala kingdom lost power. It was once the capital of a Jain kingdom ruled by King Shanthara. Humcha or Hombuja, which is 30 Km North from Thirthalli was the native place of the Shanthara kings. Hombuja has lots of artistic Jain basadis (Jain temples) and a Jain math (Jain monastery) with a beautiful big lake. 18 Km to the West of Thirthahalli, there is a village with hillocks called 'Kavaledurga' or 'Kauledurga' or 'Bhuvanagiri'. There is a fort with seven walls, built in the last decades of 16th century by a pious Keladi ruler Venkatappa Nayaka. Inside this, one can find several small ponds and temples like Kashi Vishweshwara temple, Laxminarayana temple (built on Vijayanagar sculpture style) and palace monuments. Kundadri hills is situated near to Thirthalli and Agumbe which has a beautiful pond and a old jain temple and also a very good view of the near by villages you can get. It is 30km from Thirthalli town and 20km from agumbe. By Road:Thirthahalli is at a distance of about 62 km. from the district headquarters, Shimoga. From Shimoga, one has to take the National Highway NH-13 (Thirthahalli road) to reach Thirthahalli. From Bangalore, one has to take the National Highway NH-206 to reach Shimoga and then take the above mentioned route. The total distance from Bangalore to Thirthahalli is around 330 km. From Mangalore, one can take NH-13 to reach Thirthahalli. The distance from Mangalore to Thirthahalli is around 146 km.There are numerous mini-buses from Udupi to Thirthahalli. From Udupi railway station 86 km to Thirthahalli. By Rail: The nearest railway station is in Shimoga. Numerous trains run from Bangalore and Mysore to Shimoga. By Air: The nearest airport is in Mangalore International Airport.